Often when people write about fashion they will quote one source and seem to think there were hard and fast rules followed. 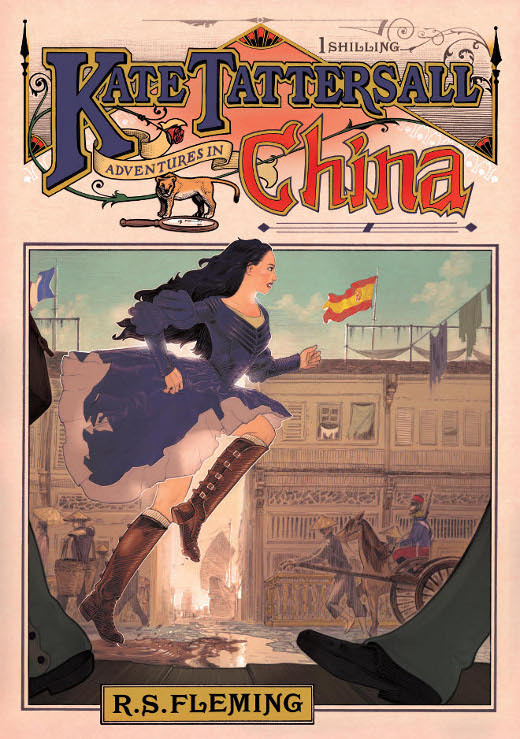 In truth, the artwork of any era reveals multitudes of styles, unlimited variety, and a great deal of tastes catered to for all walks of life. Again, the wealthy were best able to satisfy their desires and vanity in regards to clothes, and certain headdresses came and went in popularity but, rather like today, the early Victorian lady could wear what she pleased. In this 1859 study of Pegwell Bay by W. Dyce we see a party out collecting fossils and seashells. The ladies are wearing a short brimmed bonnet, a plain black felt hat with large rounded brim, and a flat brimmed hat covered with blue flower decorations. The little boy has on a peak-less cap, like a tam, that was also popular for girls and women. The grand tours which had become popular during the mid 1700s brought lavish fashion to England (the Macaronis being the most extreme). Something the ladies adopted was a form of turban, particularly for evening galas. Extravagantly decorated with plumes, pearls and jewels, crafted from luxurious silks and satins, this form of hat was definitely worn up to the early Victorian era and seemed to come and go throughout the 1800s. 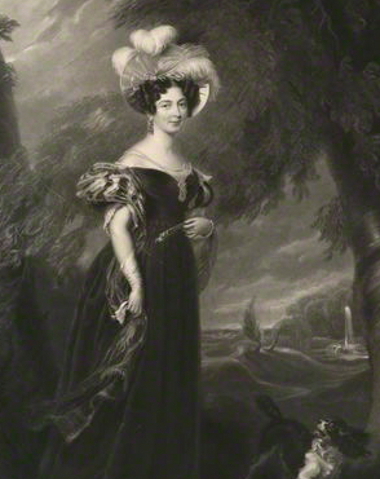 Viscountess Tullamore, by J. Cochran, 1826. I mentioned before that women wore men’s hats, and the previous article showed many examples for riding. 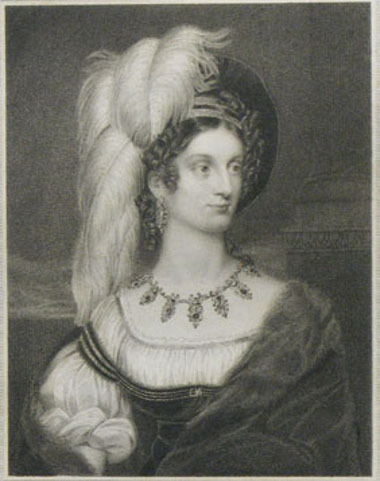 Kate Tattersall wrote of owning a “gamekeepers’ hat” or “Coke” hat (pronounced cook) which had grown fashionable around 1850. The originals were extremely stiff, made to the specifications of Edward Coke for his gamekeepers because their top hats were constantly damaged riding into low-hanging tree limbs. A rounded hard close-fitting hat would be more practical and protect the riders. When Coke arrived in London in December of 1849 to collect his prototype he placed it on the floor and stamped on it twice to test its strength; the hat withstood the test and Coke paid 12 shillings for it. Kate wore her’s rather like an early crash helmet, hoping it would protect her head in a fall. This item become known as the “derby” and “bowler” in the following decades, derby because the Coke family was prominent in Derbyshire, and bowler because they were made by the Bowler brothers, London hat makers. 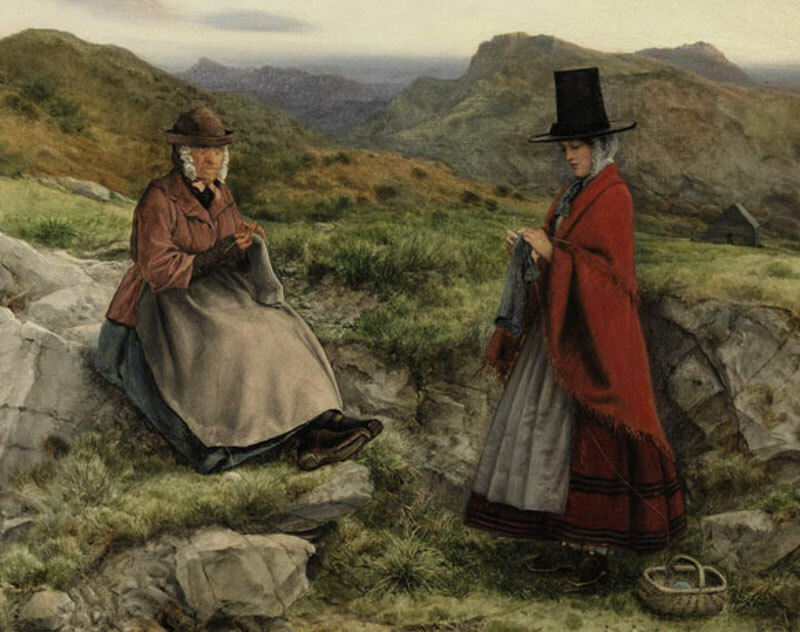 Welsh Landscape with Two Women Knitting by W.Dyce, 1860. This certainly appears to be a type of brown bowler on the left, but probably a soft crowned version that had existed for decades, and definitely a tall broad brimmed topper on the right. 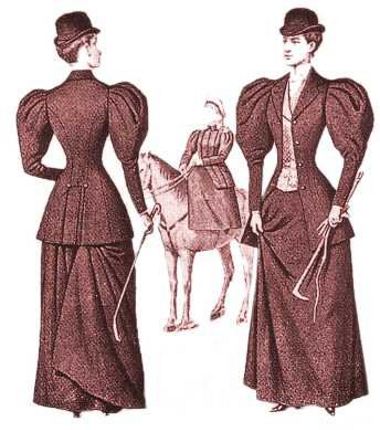 Eventually women would wear bowlers regularly with their riding habits, and top hats became less common into the late Victorian era, but by no means disappeared. As I mentioned in the first article, it was partly the improving of parasols and hat pins that led to smaller and smaller headdresses. As Britain changed with her Queen, so did the fashion. While 1856 had seen the introduction of synthetic dyes and stronger more vibrant colours, 1861 saw the nation plunge into mourning with the death of Prince Albert; Victoria wore black for the rest of her life. 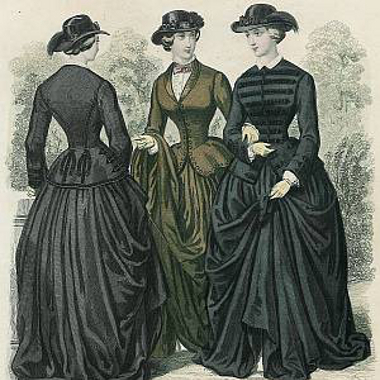 Here was the start of the mid Victorian era and with it came somewhat plainer clothes. Perhaps the exception were the jaunty little hats that flourished. Here are a few more examples of turbans and bonnets, 1835. 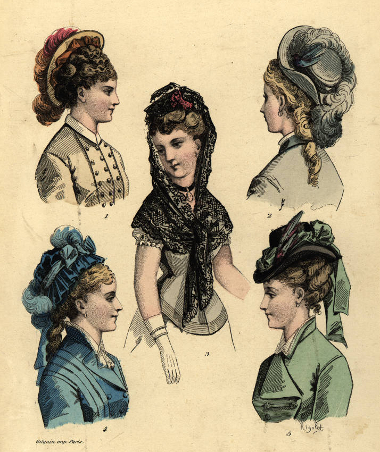 A good example of the little hats to come, 1870. Hi Debra, there are lots of options. I’ll send you a note and try to include some references. Too bad there aren’t milliners everywhere like there used to be. There’s such a limited selection nowadays, particularly for men.